This experimental chair derives all its structural strength from the conertina folds of the paper from which it is made. The structure is similar to a Chinese lantern. Here, the layers of paper have been partially opened to make a fan-shaped volume, with the vertical spine of the fan at the back of the chair. The designer sat on the form once it was partially opened, crushing the paper folds and creating the form of the seat and back: the impression of his body is still visible. The cell-like paper structure enables light and air to penetrate into the volume, and perhaps inspired the name Honey-Pop, because it looks like a honeycomb. Unlike most other seats, the user of the Honey-Pop chair is sitting on almost nothing. 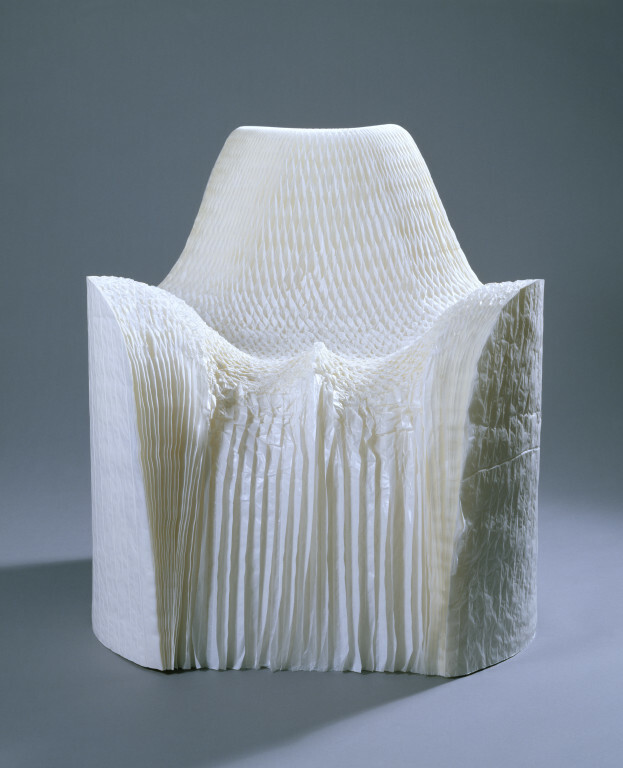 Chair made of concertina-folded translucent white paper like a Chinese lantern, partially opened to form a fan shape with the vertical spine of the fan at the back of the chair, and the impression of the designer's body partially crushing the paper to form the seat. Inscribed '19 MAY 2005 Tokujin Y 125/300A' in black ink, vertically on the rear proper left corner. Hand written in black ink vertically on the rear proper right corner. Tokujin Y is the signature of the designer. The chair is no.125 of an edition of 300. 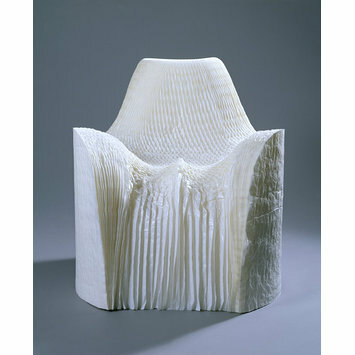 This chair is only made of folded paper yet, remarkably, it is strong enough to sit on. The concertina structure is like a paper lantern that has been partially opened up. The chair was completed when the designer sat on the paper form, partially crushing it to form the seat. The name of the chair recalls its similarity to a honey-comb.